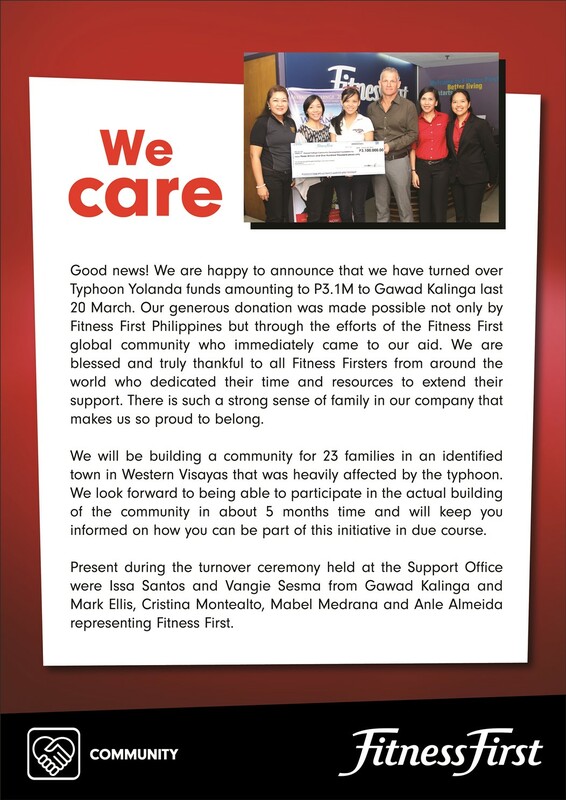 Last March 20, 2014, Fitness First turned over a check donation to Gawad Kalinga in support of the reconstruction projects for families affected by Super Typhoon Yolanda. The check turnover was held at the Fitness First Head Office in Makati City, and the donation will be used to build 1 village in the Visayas. Fitness First Country Manager Mark Ellis, Finance Manager Cryz Montealto, HR Manager Mabel Medrana and Learning and Development Manager Anle Maderazo-Almeida handed over the check to GK Corporate Shared Services Head Issa Cuevas-Santos and GK Partnerships Manager Vangie Sesma. The Fitness First family has always been there to support GK in building communities to end poverty. Three years ago (October 2011), Fitness First was able to raise funds during their Fitness Xplosion for GK’s Health Program. This was Fitness First’s way of helping GK build healthier and more ‘fit’ communities. Today, the damage brought by the aftermath of Yolanda can only be matched by the massive response of solidarity and bayanihan from many sectors of society. 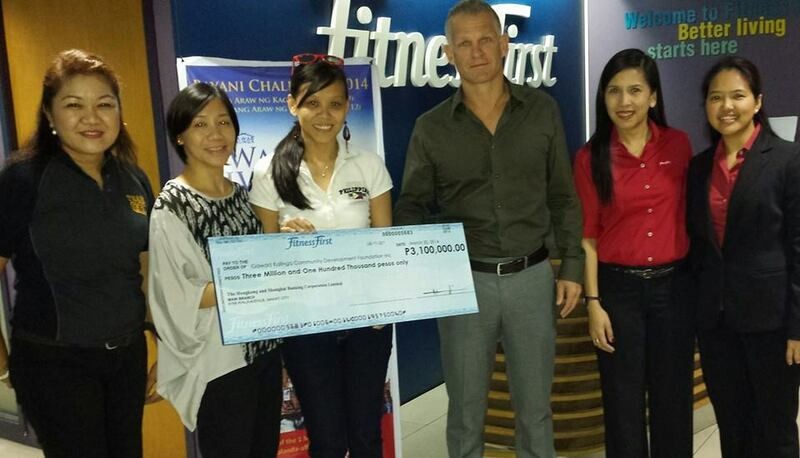 Thank you Fitness First for being one of the partners who will rebuild Visayas and ensure that we leave no one behind. Walang Iwanan! Like Fitness First, you too can be part of Operation Walang Iwanan and help GK in relief, rehabilitation and reconstruction. This coming summer, join 1 MILLION VOLUNTEERS in rebuilding Aklan, Antique, Bohol, Capiz, Cebu, Eastern Samar, Iloilo, Leyte, Negros Occidental, Palawan, Samar, and Zamboanga. Read more details about the Bayani Challenge 2014 HERE.